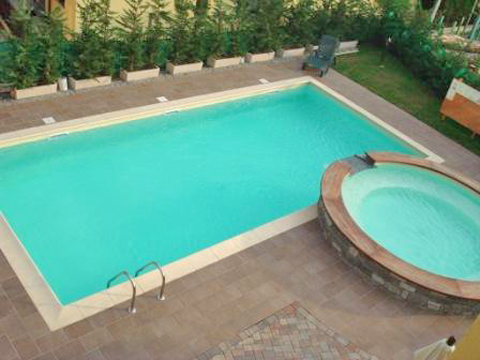 Colombo Bellano Monolocale is a modern 1-room apartment in Residence Casa Colombo, which has a large pool, jacuzzi and sunbathing area. The house in located within walking distance from the lake. 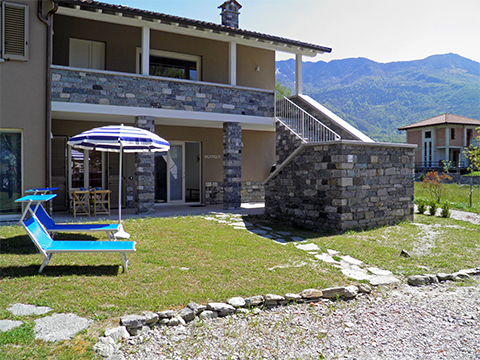 The newly constructed Residence Casa Colombo is located in the lakeside village of Sorico, with its beautiful beaches and magnificent views of the surrounding mountains. The market place of Sorico with a grocery store and bakery is about 150 meters away, as well as a beach cafe and coffee bar. 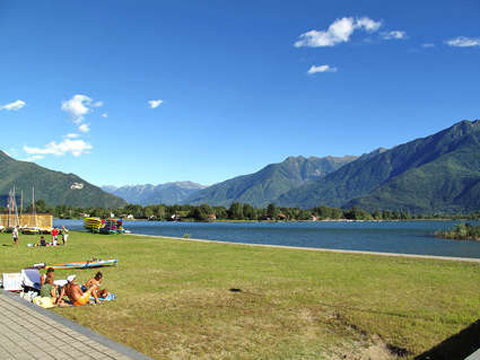 Within 150 - 500 m are 3 trattoria-pizzerias, which are within walking distance.The lakeside beach is only about 80 meters away, here you can swim, fish, and moor your boat. Colombo Bellano Monolocale is a 1-roomed apartment consisting of a living area with kitchen corner, dining table, sofa bed for 2 persons and a bunk bed area with 2 single beds. The bathroom has a shower, toilet, bidet and washbasin. 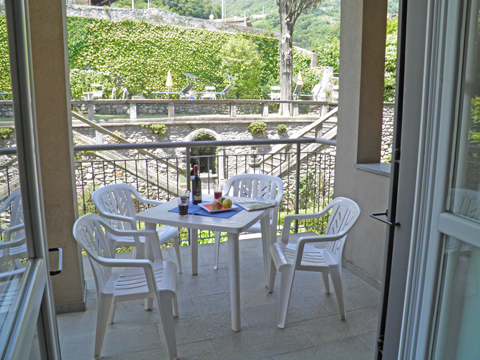 Each apartment has a terrace or balcony with beautiful views of the mountains, and access to the large communal garden with lawn. Guests have also the beautifully designed pool (4 x 10 m, depth 140 cm) and a jacuzzi/ Whirlpool. 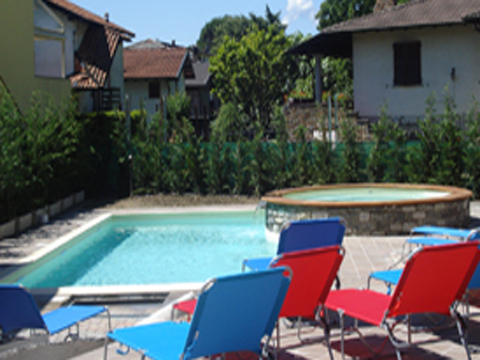 The pool is heated so that the swimming season can begin at Easter. The flat and vast beaches of Sorico in close proximity to the residence are especially suitable for families with children. The beach is also popular with surfers and kite surfers, as here they will often find the ideal conditions for their sport. 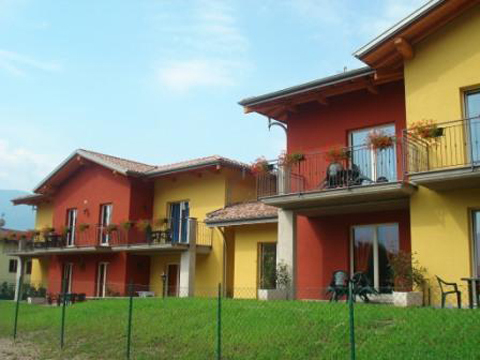 The Family Residence Colombo in Sorico offers plenty of space for children and sports enthusiasts. Sorico has great beaches and an attractive children's playground. From the property you can easily take a hike in the nearby mountians. 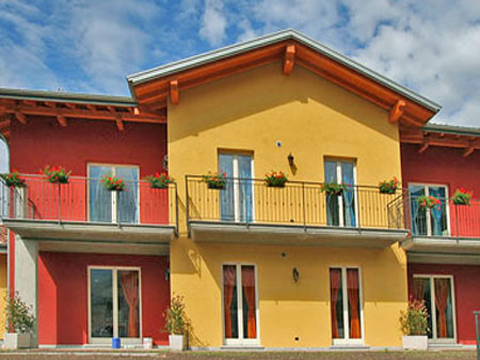 The larger neighboring village Domaso is just 2 km away and offers plenty of shopping and leisure opportunities. A place to store surfboards and bicycles is also available. In the basement there is a communal laundry room with washing machine. A garage space is available at extra charge. TIP: The Holiday Residence Colombo consisting of 10 apartments is ideal for tour groups, and families or friends who want to holiday together. 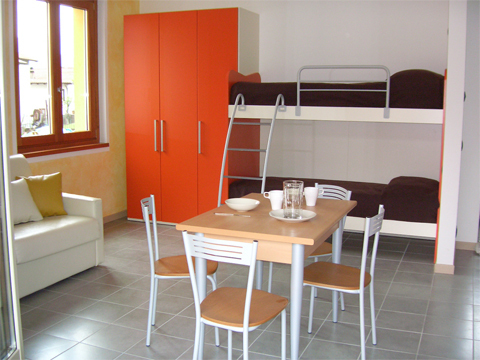 The apartments are practical in a modern style with high quality furniture. 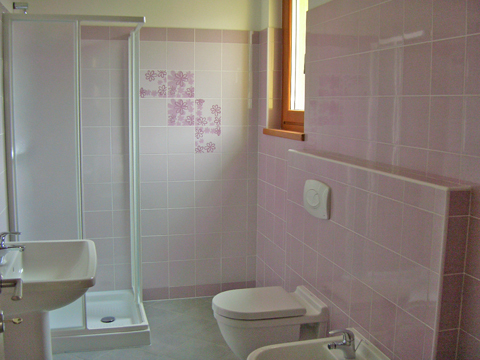 Two apartments are equipped with bathrooms suitable for the handicapped. Video Watch a nice video from Apartment Colombo Bellano Monolocale in Sorico? 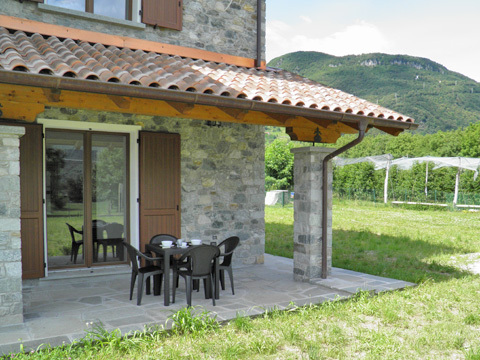 This holiday apartment is offered on behalf of the owner of Casa Colombo Bellano Monolocale in Sorico, partner since 2011. You pay your rent safely to Holiway GmbH and we regulate the payment with the landlord. When booking, you can choose between convenient payment methods. 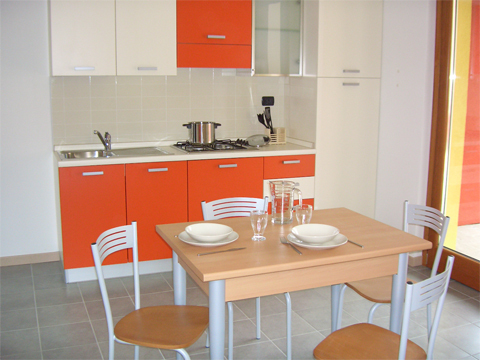 Watch a nice video from Apartment Colombo Bellano Monolocale in Sorico?